This year I've decided to be ambitious with a double release for Black Friday even though the time table here can sometimes choke the fun. 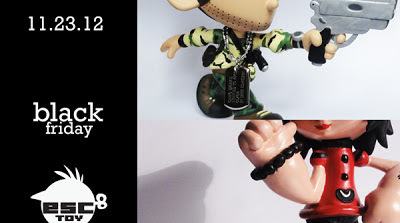 First will be the Marina Oyl resin figure which will include an isty bitsy pipe and the Camo Drake with a custom dog tag. Anyone that purchases the Camo Drake will be entered to win a Drake Shiro "all white" figure. Both will be available this Friday 11/23/12 at 12am EST at the ESC Shop.